Microsoft Outlook is undoubtedly the most popular desktop email client utilized at the personal level or in most of the organizations worldwide. Not only it offers a number of highly advanced features, but also provides access to important emails and crucial incorporated data and attachments even the absence of reliable internet connectivity. Sometimes, the Personal Folder file (PST) or Outlook becomes unavailable due to unknown reasons and therefore, it is vital to know the repair methods to prevent the circumstances that might affect the working functionality of MS Outlook. Next, click on ‘Quick Repair’ or ‘Online Repair’ and follow instructions. The above-mentioned steps would help to repair Outlook 2016 if there is any functional issue with the application. The procedure is secure and doesn’t lead to any loss of data. Online Repair is a reinstall that does not affect the integral files or the User Settings. Quick Repair locates, analyses and replaces the corrupt files. 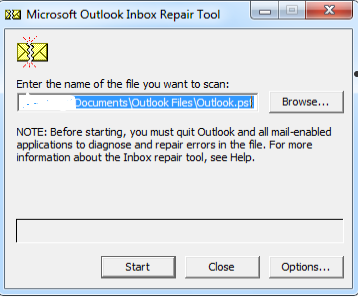 However, if MS Outlook PST file undergoes corruption, it can be repaired using Inbox Repair Tool (ScanPST.exe). Note: To run the Inbox Repair Tool in order to repair Outlook files, first you need to exit MS Outlook application. Now, when the workaround procedures to bring MS Outlook back to running mode are elaborated, it is important to understand the reasons that are responsible for Outlook inappropriate functionality. Let’s identify these factors thoroughly. To repair Outlook 2010, 2013 or 2007 along with latest edition 2016, it is important to understand the key reasons behind corruption and attempt to fix outlook pst. It could be the bad sectors on storage disk failure due to which the hard disk might get corrupted. As a result, the PST files existing on these sectors might turn inaccessible or corrupted. Another reason can be the faulty devices such as network cables, hubs, routers, cards or any other connecting devices. Software related issues that contribute to PST failure could be the file system disaster. In such cases, some of the PST data might become corrupted or lost. The possibilities are that the PST file is overwritten by garbage data and this sometimes makes the file unreadable. Also, there are antivirus applications that affect the functional parameters of application; therefore, before starting up repair Outlook, it is important to detect the actual cause. However, a little consideration while launching MS Outlook application as well as terminating the same can prevent severe damage to the platform or the incorporated files. PST Corruption can happen anytime, it is our responsibility to backup data on a regular basis so as to prevent its integrity and maintain workflow. Although manual procedures are helpful in repairing PST data, integrity and security of the mailbox folders can’t be assured. Encrypted and oversized PST files can be repaired and recovered. Selective recovery allows repairing important items while dumping unnecessary data. While working with Microsoft Outlook 2016, 2013, 2010, or any other previous edition, it is mandatory to run the Outlook appropriately while considering some important guidelines. Such a good post to repair pst file as well as Outlook . I tried the manual step (quick repair) for my Outlook; it works. Software also seems impressive but I’ll try it later. You can still try the demo version to check the features of the software, as trial version is completely free. Nothing wrong with Outlook but pst file is causing the error. Tried scanpst but no help, any further solution? Agree, scanpst is useless! I mean, what is the use of this utility if it cannot repair the file over 2 GB! @Nicole: It seems the level of PST file corruption is beyond the ability of Scanpst to repair it! So in case scanpst doesn’t work for you, third party tools are the only solutions to repair the corrupt PST file. Just a quick question & need the honest answer! Have you ever noted if scanpst repaired the pst file and recovered almost all the data without losing a single email or email item from a damaged pst? @Edwards: Scanpst has some limitations, it can only repair the pst file accurately if the pst file size is under 2 GB. And it is very rare if I had noticed any problem using scanpst because here in the organization we had very large pst files contains very important & confidential data, which we usually repair using our Stellar Outlook pst repair tool. We don’t want data loss anyhow!! So my answer to you, if you have small size of pst file which is corrupt or anonymously inaccessible, always try inbox repair tool before trying anything else. Rest, you can try mentioned software above in the blog post. Where can I get the license key to activate the full version of stellar outlook pst repair tool? You’ll have to register the software to get the software activation key. I found Outlook repair bit harder than repairing a pst file. I was searching pst file repair methods randomly, and anonymously I clicked here. Great post! It covers all the versions of MS Outlook. It just worked. Didn’t try the software but I know stellar data file repair tools are even better than others. Every-time I repair my pst file with scanpst, it works for couple of hours, but I don’t know why it is getting corrupted frequently .. I restart my Outlook after few hours, it is gone again. Really frustrating ! Using Outlook 2013 on Windows 10. I really wanna check what is the size of your PST file. Because most of the cases oversized PST file fails more frequently even after manually repaired. What are the limitations of stellar pst repair tool free version? Free version shows you the preview of corrupt PST file, and assures you what items can be recovered. Perfect finding..! I was searching pst repair software to repair my Outlook 2010 data file. It just works. Yesterday, I purchased this one software but unable to activate. I am law professional in Ohio so unable to initiate technical procedure without assistance. Can you provide any guide for online key activation? The quick repair didn’t solve my problems. I’ll try and manually repairing it by following your guide. In case if manual repair fails, you may go with the software I suggested in the post. Can I repair archive PST file i.e. availbale on external hard drive? Our software easily fetches corrupt PST file from an external drive. Is the above software supports all OS versions? This software is compatible with all versions including latest Windows 10 OS. I am user of Outlook 2010, when I open my email account in Outlook is gives an error message “PST file has reached its maximum limit”. How can I solve this problem? Please suggest!